A 19th century, dark blue jasper dip teapot. The teapot has impressed marks to the base which are 'WEDGWOOD' , above the three letters 'DJK'. This is the date code for the year 1882. There is also a separate 'M' which may be a workman's mark. 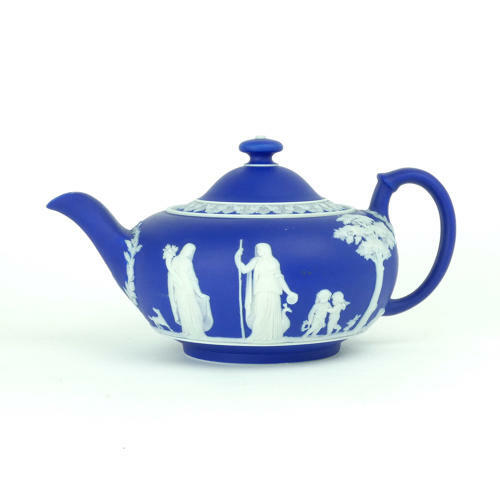 The teapot is decorated with a band of classical figures and trees. There are various foliate borders around the handle, spout and the rim of the lid. The reliefs are all good quality and the jasper dip is a very good, rich shade of blue. It is in excellent condition and it could be used.